To be frank, Amsterdam’s Koninklijk Instituut voor de Tropen, more informally known as the Royal Tropical Institute, is not the first place you’d think of for a lunch of pulled chicken marinated in hoi-sin and star anise. 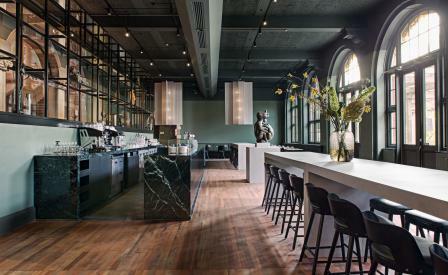 The stately Dutch Gothic Revival pile was designed by J.J. van Nieukerken in 1926 as a centre for promoting trade in Holland’s colonial territories, but the opening of the Grand Café de Tropen is likely to draw a new demographic to the edge of Oosterpark. Local practice Piet Boon has been careful to keep the bones of the original restaurant intact; the silhouette of the arched doors is reflected by the graceful curved windows that open onto park views, while natural timber floors and white-streaked black marble, a green stone bar and glass cabinet of objets add a contemporary touch. The star attraction, of course, is chef Robin Tiemessen’s all-day Asian-inflected menu of oak-smoked salmon with pickled sweet and sour cucumber, and tuna served with a seaweed mayonnaise.